Considering the shortage of medicinal plants and the need to sustain ism, cultivation and sustainable harvesting of plants from the wild has become absolutely necessary. One way of solving the problem would be to encourage cultivation by small farmers and tribal people and make big manufacturers of herbal products source their requirements from them. 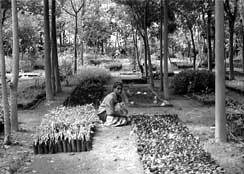 Rajendra Gupta has identified some techniques for cultivation. The biodiversity-rich areas could be identified and the materials could be grown there. Many tree species could also be grown around agricultural lands or some plants can also be grown along with other plants/crops. For instance, ashwagandha can be grown with soybean and garlic. Cultivation would help one more problem -- adulteration. "The authenticity of the medicinal plant can be ensured only through cultivation," feels Mohammad Iqbal. And the best thing way of doing so is by involving small-scale farmers in the cultivation and to grow plants that are region-specific. Specificity of the herbs can actually be of advantage to the country. Cultivation of ashwagandha in California, for instance, was a failure, informs Akhilesh Sharma, consulting ayurvedic physician and founder chairperson of the Global Society for Promotion of Ayurveda According to him, it was found that the plants did not have "active ingredients" in required concentrations. In viewof this, it seems more feasible to grow plants in their natural habitats or at least in areas which are near to the habitat. Another crucial factor is involvement of local communities, especially in small fragmented areas. However, Shailja Chandra, secretary, department of ism& homeopathy under the ministry of health and family welfare (mohfw), feels it is not feasible to involve communities as their plants may not be of the same quality -- a typical government reaction to which many experts beg to differ (see interview: "Maybe communities can be involved to cater to the local needs"). "Traditionally, it has been the tribal communities and women who protect the rich biodiversity of the region" says M S Swaminathan, eminent agricultural scientist and director of the M S Swaminathan Research Foundation, Chennai. As an added advantage, the cultivation of medicinal plants would in fact prove to be a source of income for the communities. Communities in the medicinal plant rich areas can be identified and they can form cooperatives under the village panchayat . "As the panchayats can take up the work of interacting with the forest officer, the communities can grow the plants without having to run around to get certificates," says Balendu Prakash. Land availability Where cultivation is concerned, land availability comes a cropper. In India, there is hardly any land that is not under cultivation. The only options are forest lands, which are under the government, and revenue wastelands, on which the government is now attempting to cultivate medicinal plants. Regarding cultivation on forest tracts, the government, under the Integrated Tribal Development Project, allowed the Kani tribe of the Western Ghats to grow Trichopus zeylanica (arogyapacha) in the forests, but did not allow the sale. In this case, the people were allowed to grow the plant in the backyards of their forest settlements. But as the forest officials could not differentiate between the plant that grew in the wild and that which was being cultivated, the people were stopped from taking the material out. This not only took away their only source of livelihood, but also forced closure of the unit -- Arya Vaidya Pharmacy in Coimbatore -- that was dependent on arogyapacha for manufacturing Jeevani, a herbal tonic. Unless glitches such as this are removed, there is no place to carry out cultivation. "The forest officers do not know anything about the medicinal plants and neither would they gain anything by growing them in the forest and, therefore, they are least interested to pay them any attention," says Rajendra Gupta. Traders rule Keeping aside the option of using forest land, the other way of ensuring cultivation is by encouraging farmers to grow plants on land where crop cultivation is already being carried out. For this, the farmer needs to be given government incentives to move from an assured market to a risky one. These incentives are totally lacking at present. The government does not have any project to invite small farmers, nor does it make cultivation easy through providing seeds and loans. Even though farmers would be earning eight times more than the money they make by growing wheat or rice, they are not willing to grow medicinal plants, says Balendu Prakash. A large number of studies carried out by different organisations have shown that the cultivation of medicinal plants is a very lucrative business. But at present the cultivator has to take risk of the whole enterprise himself. "Starting from the identification of the plant that can be grown in his soil to the identification of the buyer, the whole thing has to be done by the farmer himself," says B G Agochia of Gandharva Nursery and Floriculture, a Jabalpur-based firm involved in the cultivation of medicinal plants for the last 19 years. Says Chandra: "We will have to have a buy back policy. For this, it is necessary to know the actual demand for the raw material and the traders have to come forward with these figures." The Medicinal Plants Board, which was established in November 2000 to look into "all aspects" related to medicinal plants, will decide on the incentives, besides deciding on conservation and collection of raw materials, legal issues and patents. The board comprises trade, marketing, pharmaceutical industry and medico-ethnobotany representatives. Cultivators, researchers, non-governmental organisations and state government are also expected to play a crucial role in the functioning of the board. Ranjit Puranik, chief executive officer of Dhootapapeshwar Limited, Mumbai, also feels it is necessary to know the consumption figures before giving the buy back assurance. But manufacturers and traders are highly tight-lipped about their consumption data. Consumption figures of some companies and the money spent on raw materials have been compiled by the Planning Commission, but the information is sorely insufficient. Besides, manufacturers and traders are not keen on buying raw materials from the farmers because material collected from the wild is available at a lower price. There are no cultivation charges because booty from the wild is free for all. And herb gatherers are anyway exploited in the most ruthless manner. Agochia gives an example of amla : cultivated amla costs some Rs 5 per kg, but that collected from the wild is available for Rs 2 per kg. Traders and agents literally control the market prices. Practitioners of ism want government intervention to make the market more organised. Warrier feels that the government should buy the raw material from the farmers, and then supply it to the manufacturers. If this is done, agents and mediators can also be sidelined, he says. But given the experience of the nationalised ntfp business, where government controls the sale, it is doubtful whether this arrangement, too, will work. Besides the lack of incentives to grow medicinal plants in the backyard, the legal tangles are too many for small-scale farmers to handle. The Centre has two main laws governing medicinal plants, namely the Indian Forest Act 1927 and the Wildlife (Protection) Act, 1972, but different states have amended the rules as per their specific requirements. In Gujarat, the cultivator has to get his name registered with the state government if he cultivates amounts exceeding that prescribed as per the Gujarat Minor Forest Produce Trade Nationalisation Act, 1979. The Kuth Act 1978 of Jammu and Kashmir bans the cultivation of kuth, Dioscorea deltoidea (singali), Atropa belladonna (belladonna), Colchicum luteum, Podophyllum emodi, Lavetra kashmiriana, Hyoscymous niger, Artemisia maritima and Inula racemosa (puskarmool), which are all very important to ism . The state of Himachal Pradesh gives loans, but only for collecting, marketing and processing medicinal plants -- not cultivation. Until recently, when Uttaranchal was given statehood, there was a restriction on cultivation of medicinal plants. The cultivator had to register with the Bhesaj Sangh, a state cooperative body. At the time of harvest, both the Bhesaj Sangh officials and the forest officials inspected the plants. The royalty that was levied on the sales was as high as 10 per cent. Says Balendu Prakash, "As the process of getting a licence required a lot of running around, the farmers who lived in remote areas were not able to grow the medicinal plants." But after the formation of the state, the legalities have been relaxed, more so due to the persistent efforts of Balendu Prakash. "We have 600 farmers ready to grow medicinal plants," he says. Two main government organisations involved in the process of development of agritechniques are the Indian Council of Agricultural Research (icar) and the Council of Scientific and Industrial Research (csir). While both the institutions are emphasising on the cultivation of annuals and biennials, the plants that are in short supply are usually perennial like products from trees. Tree species are also among the most-needed for ism . They account for 33 per cent of the total need, the rest is sourced from herbs, shrubs and climbers. "Research institutes are not interested in working on perennials as it takes a long time for the results to show," says Rajendra Gupta. The major chunks of the funds available to the department of ism&h, created specially for the purpose of creating some order out of the chaos, are being used for the purpose of education and research. Though research also includes a small amount of focus on the cultivation of plants, it is mainly for demonstration purposes. One fails to understand the usefulness of the research when the plants that are being researched continue to disappear through overexploitation and environmental degradation. The Central Institute of Medicinal and Aromatic Plants (cimap), Lucknow, Uttar Pradesh, has been established under csir and the National Research Centre on Medicinal and Aromatic Plants (nrcmap), Anand, Gujarat, has been set up under icar to study quick-growing herbs. Both ncrmap and cimap have so far developed 30-odd techniques but instead of providing practical knowledge about medicinal plants to the farmers, the institutes are content on carrying out theoretical research, allege vaidyas . "We are never involved in the process of deciding which plants need to be worked on," says Brij Bihari, practicing ayurvedic physician based in Lucknow. This way the country is losing out on the experience the practitioners have. But A K Singh of the technology transfer division, cimap, says: "We cannot give out any information regarding what we are working on due to the problems with the intellectual property rights." There is a lot of duplication in the efforts between the two institutes and even within institutes. For example, under icar, Gujarat Agricultural University, Haryana Agriculture University and Jawaharlal Nehru Kirshi Vishwa Vidyalaya , Madhya Pradesh are all working on liquorice (Glycyrrhiza glabra), which is used in the manufacture of cough syrups. Meanwhile, in its Vision 2020: Perspective Plan, nrcmap has listed the names of plants on which the work would be carried out in the next 20 years. The choice of plants to be researched is poor. Plants like isabgol (Plantago ovata), senna (Cassia angustifolia) and ashwagandha on which work has been going on for the last couple of decades will be extended. Many other plants, which neither feature in cites, Tewari's or the ministry of commerce's list, are being researched by nrcmap though they are available in abundance. Further, plants like Artemisia annua and talisapatra, which also feature in nrcmap's list, are already being studied by cimap. So in the next 20 years, too, we cannot really hope to have agritechniques for plants that are in need, in short supply but are very cultivable. The government, under new schemes, is now funding many institutions to undertake research on agritechniques. In 1995, the department of ism&h identified 133 plants for which agritechniques needed to be developed. During 1997-98, the department sanctioned 26 projects for 94 species. During year 1998-99, eight more were sanctioned to cover 32 more plants. Institutes such a nbpgr, Forest Research Institute in Dehradun, Kerala Agriculture University, G B Pant University in Uttaranchal are at present involved in the work. "We hope to get important information by the end of five years," says Rajendra Gupta. However, unless the institutes work with farmers and the government revises its policies on cultivation, the research could remain on paper. Besides, the list of plants on which work is going on is not comprehensive. Some of the tree species like agarwood and Cedrus deodara (devdar), which have been in short supply for more than a decade are not being worked on, according to the list provided by Sandu Brothers, Mumbai-based manufacturers of herbal products, to the Planning Commission.